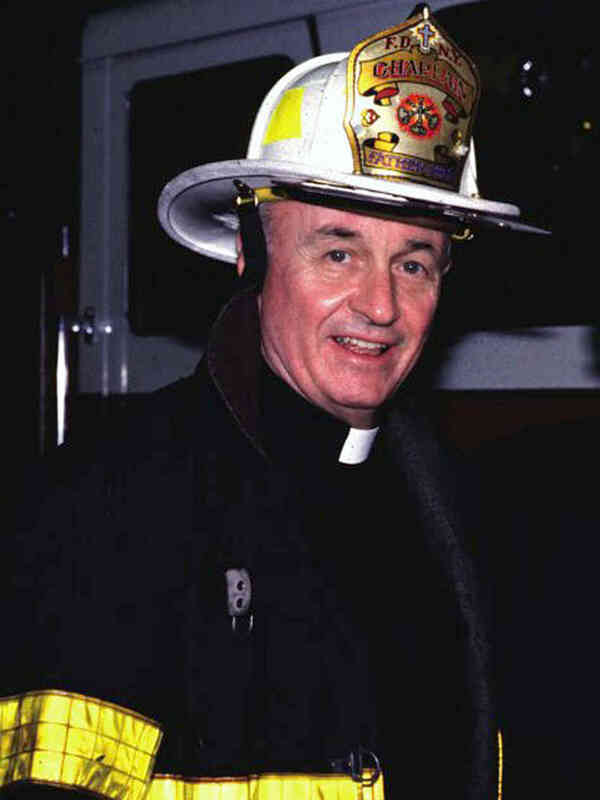 Father Mychal Judge, chaplain with the New York City Fire Department. The events of September 11th, 2001 both ripped a hole in the nation’s heart, and in some ways, brought this nation together. People came together in their collective grief, to help one another heal. Such was certainly the case with Franciscan friar Mychal Judge, a man beloved by many different groups, whose death was mourned by all who knew him. When not working with the fire department, Judge could be seen everywhere. He walked the streets of New York with a handful of dollar bills for the homeless, blessing the people he encountered. He befriended everyone, everywhere. He performed baptisms, funerals, and sometimes preached from the pews so he could be among the people rather than standing over them. His answering machine was full of messages and requests; he would stay up until all hours listening to and responding to them all. He rarely, if ever, forgot a face, or the personal story of that person, and would send cards and notes regularly to those whose lives he touched. Mychal Judge was one of the first priests to work with people suffering from AIDS. He gave first rites, comforted the partners and families of those left behind, and when the gay Catholic organization Dignity needed a place for its ministry, Judge offered St. Francis of Assisi. His work and support of gay organizations was not only typical of Judge’s atypical way of ministering to the people, but representative of a part of his life not many knew about until after his death. Although he took his vow of celibacy as a priest, Judge was gay. It was simply a part of him. Judge had been a recovering alcoholic for years, and because of his own problems with sobriety, he could in turn counsel others who were struggling with alcohol. His alcoholism and homosexuality put Mychal Judge in a very unique position to understand and help people on a personal level—not only as a priest, but as a human being. And that was how he died, helping people right until the end. As soon as word came of the 9/11 attack on the World Trade Center, Judge was there with the FDNY, giving first rites and doing what he could, until he was struck with debris from the collapse of one of the Towers. When his body was discovered, several firemen gently placed him in a chair and carried him out of the building. He was the first official casualty of the tragedy; that day, over 300 firemen lost their lives, but the rest carried on, fully dedicated to their work. One fireman, Craig Monahan, felt that Judge died as he did, right in the beginning moments, to lead the way to Heaven. After his official funeral, there was a gathering in the church where Judge had attended Alcoholics Anonymous meetings. The gathering drew an unusual assortment of people—firemen, members of clergy, policemen, homeless people, gay people, recovering alcoholics, Irish bands Judge liked—people for whom the only common denominator for their presence was Mychal Judge. He was that kind of man—loved by all who knew him, in whatever capacity. His memory lives in the hearts and minds of those whose lives he touched. Father Christopher Keenan. Photo Mariela Ariela Lombard for New York Daily News. Most people do not know that Father Mychal Judge was preparing to go to Jerusalem at the end of September with Steven O'Donald, the police officer who had been totally paralyzed in a shootout with a young teenager. The two of them were supposed to go to Jerusalem on a journey of reconciliation, as they had done in Northern Ireland and in other parts of the world. I met Mychal when I was 21—39 years ago. He is responsible for extending to me the invitation to consider this life of service that we celebrate this morning. When I was ordained 31 years ago, my first assignment also happened to be with him, so my first years of service in the ministry were with him. And then 25 years later, as I came to New York to be with my parents, until they went to God, and to pursue helping homeless children and their moms in the shelters of the city, it was a particular joy to be living again with Mychal in the Franciscan community. In the Fire Department, when we are commissioned, we all make a vow to protect life and property in the City of New York. With Chief Nigro, and on behalf of the entire Fire Department family as well as the 342 other firefighters that died with Mychal, we accept this wonderful Roger E. Joseph Prize. We remember that in accepting this beautiful award, that Mychal is a person who said "yes" to life more often than "no," because he believed that a living God wrote the agenda of his day. In placing himself second, he honored everyone he met by making them first in the investment of his time and his energy in service. It's because of this that he is so fondly remembered and loved. Mychal lived among many constituencies, not only the Franciscans and the Fire Department. He lived among many constituencies -- often with controversy, but his passion for justice and his empathy for the underdog is something he would never compromise. That was Mychal's life and he especially found himself at home with the wonderful family in the Fire Department, who with their own passion for justice, protect life and property in this city. We're reminded as we journey in this wonderful celebration of service that Mychal was also a very human, fluid, complex person—just like the rest of us. His legacy to us is to remind us that this is the stuff of greatness. So as we of the Fire Department receive this wonderful prize, the Roger E. Joseph Prize, we remember that Mychal is honored not because he died a hero, but because he lived one. He is the symbol of the almost 3,000 people who gave their lives that day so that we might live in freedom. We honor here the gift—the last gift of a gracious heart. It is really to that greatness of heart to which we are all called that we receive this prize.